Hockey Book Reviews.com: Which Habs Book Is For You? Which Habs Book Is For You? It comes as no surprise that there are several high quality books out this year on the Montreal Canadiens. Hockey's greatest team is celebrating it's centennial, after all, and authors, publishers and book sellers are playing a big role in giving fans a taste of Montreal history to take home with them. 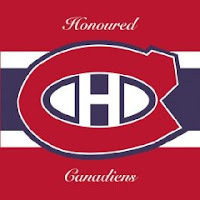 Habs Heroes: The Definitive List of the 100 Greatest Canadiens Ever By Ken Campbell/The Hockey News: THN senior writer Ken Campbell polled a panel of experts to come up with a definitve 1-through-100 ranking of the top Montreal Canadiens players of all time. Campbell then goes about writing brief biographies for this action packed book. There's plenty of colour photography to compliment the great writing. Published by The Hockey News/Transcontinental Books. The Montreal Canadiens: 100 Years of Glory by D'Arcy Jenish: This book appears to be the early popular favorite, appearing on the Globe And Mail's best seller list earlier this season, one of only two hockey books to do so this fall. Jenish retraces Montreal's long history through the words of Montreal's sports writers over the years. He must have spent countless hours researching and compiling this work, but it pays off big time. He offers a unique, thorough, and honest history of the Canadiens, warts and all. It is not a history written through nostalgia-coloured glasses like every other Habs history title. Patrick Roy: Winning, Nothing Else by Michel Roy: This Patrick Roy biography, written by his father Michel Roy, is the English release of the 2007 French mega hit Le Guerrier . Roy remains in the news despite retiring from NHL competition, so this book will be of great interest to many fans, and not just Montreal fans. The book is a little long-winded, but you get an honest look into one of hockey's leading personalities. Roy was at times mysterious and at other times down right controversial. This book looks into it all. There is another book coming in January 15th, 2009. Wiley is reproducing the classic Lions in Winter by Chrys Goyens and Alan Turowetz. It's actually the third edition of this blast from the past. None! Go Bruins! Maybe "how the habs fans robo-voted the all-star game"